Gliese 581 may be small as stars go, but it looms huge in the vision field of planetfinders. As of yesterday, measurements indicate the system has six planets of which three are Earth-size and -type, within the star’s habitable zone, with stable, near-circular orbits. The Gliese 581 system has a persistent will-o-the-wisp quality. Almost each of its planets (c, d, e and now g) has been pronounced in turn to pass the Goldilocks test, only to have expectations shrink when the data get analyzed further. The first frisson of excitement arose when 581c was determined to be Earth-type, which quickened the usual speculations: atmosphere? water? life? We don’t know yet and our current instruments cannot detect biosignatures at that distance (short of an unencrypted request for more Chuck Berry). But there are some things we do know. Gliese 581 is a red dwarf, a BY Draconis variable. This makes it long-lived; on the minus side, it may produce flares and is known to emit X-rays. Planets in its habitable zone are so close to it that they are tidally locked, always presenting the same face to their star. The temperature differentials resulting from the lock imply hurricane-force winds and tsunami-like tides. Gliese 581g, like 581c, is large enough to retain an atmosphere; the hope is that, unlike 581c or Venus, its specific circumstances have not resulted in a runaway greenhouse effect. “Whether Gliese 581c [g] is so hospitable that we could live there or so hostile that we could only visit it vicariously through robotic orbiters and rovers, if it harbors life — even bacterial life, often mistakenly labeled “simple” — the impact of such a discovery will exceed that of most other discoveries combined. Unless supremely advanced Kardashev III level aliens seeded the galaxy like the Hainish in Ursula Le Guin’s Ekumen, this life will be an independent genesis, enabling biologists to define which requirements for life are universal and which are parochial. 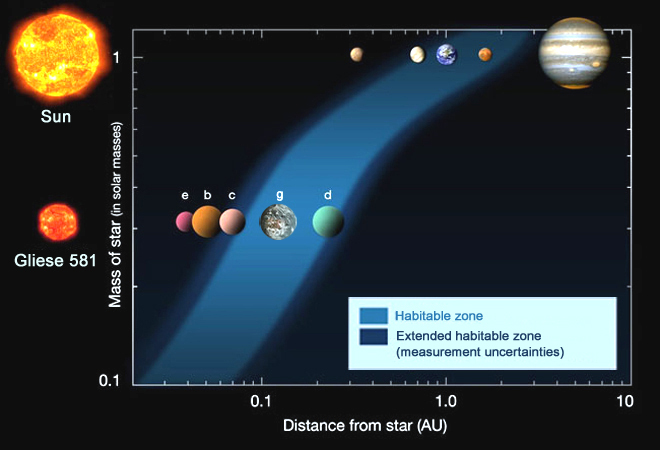 Images: Top, comparison of the Sun and Gliese 581 habitable zones (the diagram is by Franck Selsis, Univ. 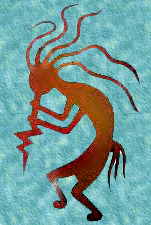 of Bordeaux; the image of 581g was originally created for 581c by Ginny Keller); bottom, Kokopelli playing his flute. Note: This article has been reprinted on Huffington Post. This entry was posted on Thursday, September 30th, 2010 at 2:29 pm	and is filed under Science, Space Exploration. You can follow any responses to this entry through the RSS 2.0 feed. Both comments and pings are currently closed.